Saturday morning we woke up to snow falling. I love snow, and so do my kids, but snow seems to make them a little bit frantic, and crazy. Sadly, even after four kids, I am still not a morning person, but there’s something about snow falling while sipping my piping hot cup of coffee that can make even the most chaotic morning just a little bit magical. Still, there was something missing, and my coffee seemed…lonely. So I decided to use my last can of pumpkin and make some pumpkin bread, the perfect accompaniment to any snowy morning, and another pot of coffee. The kids went out to play in the snow, which wasn’t even sticking, and I waited for our bread to finish baking, soaking up every stolen minute of peace and quiet. Right about the time the troops clomped in feeling frozen the bread was ready to eat. 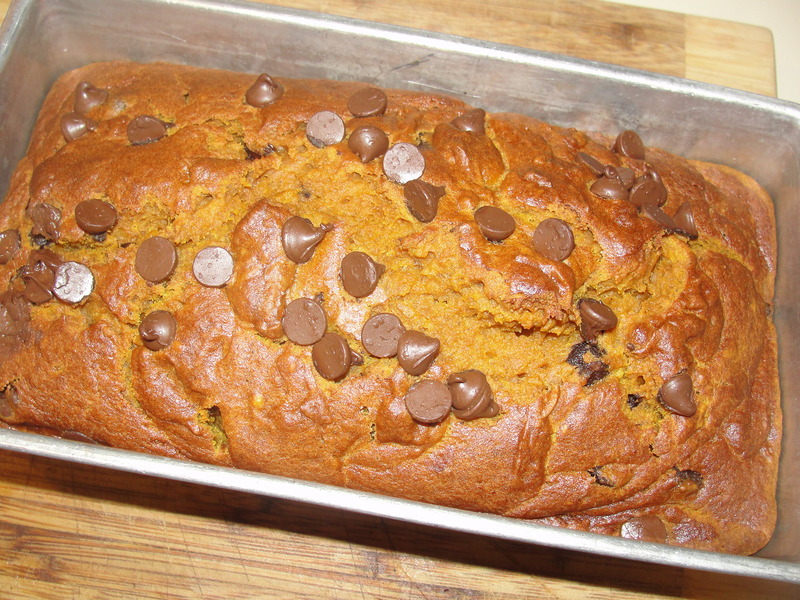 This pumpkin bread is easy and delicious, and sure to get all the kids around the table ooh-ing and aah-ing. It’s so good, that they won’t even want to talk between bites of deliciousness and sips of milk. For a treat I threw in some chocolate chips, around 1/4 cup, and even threw a few on top for a ‘garnish’ because I find chocolate so aesthetically pleasing. I was going for magical in the midst of chaos, remember? Morning, noon, night, what day couldn’t use a little magic in it! Make some ‘magic’ of your own today. *To make your own easy brown sugar, add 1 tbsp molasses to 1 cup of sugar and mix together thoroughly. Just like store-bought brown sugar, extras can be stored in a ziplock bag and put in the pantry, cabinet, etc. for future recipes. In a stand mixer, blend oil and sugars together. Stir in the beaten eggs and canned pumpkin. Gradually add the remaining dry ingredients, mixing until evenly incorporated. Add 2 cups of water to your crockpot, and then sit the loaf pan inside the crockpot. Cover the top of the crockpot with 8-10 paper towels. This is important as it traps the moisture and condensation so the bread doesn’t become ‘mushy’. Place the lid on the crockpot, keeping the paper towels securely in place. Bake on high 2 1/2-3 hours. Bake pumpkin bread 50-60 minutes in the oven, or until a toothpick inserted in the center comes out clean.